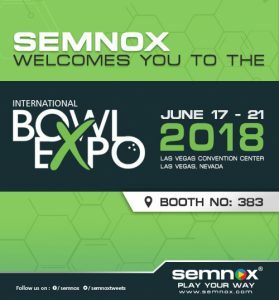 Semnox will be attending International Bowl expo 2018, held at Paris Hotel & Las Vegas Convention Center, Las Vegas, Nevada between June 17th to June 21st 2018.
International Bowl Expo (IBE) is the bowling industry’s premier annual convention and trade show featuring exhibits of a wide array of products and services. IBE also presents dozens of interactive seminars and “how-to” workshops that aim to assist proprietors, leveraging the latest tools and technology to improve and strengthen their businesses. The sessions serve to educate and expose proprietors to the latest trends, marketing ideas, profit center opportunities and new information about the industry to help build their businesses and spread the excitement of bowling throughout their communities. Attendance at International Bowl Expo is open to any owner/operator (or their employees) of a bowling center, billiard center, pro shop, or industry partner. Domestic companies, manufacturers, suppliers, or distributors that do not own/operate (or are the designated representative of) a bowling center, billiard center or pro shop must purchase an exhibit booth to participate in International Bowl Expo.